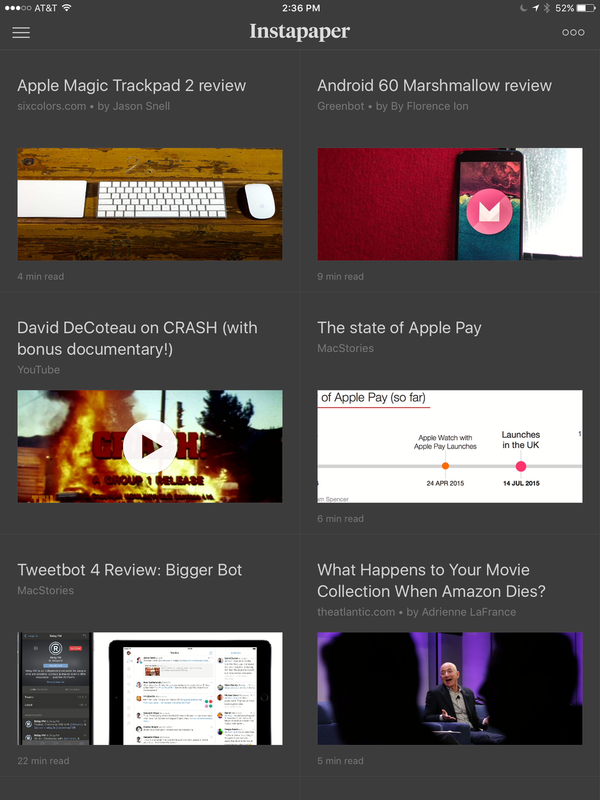 Instapaper 7 packs in a variety of subtle improvements, such as a navigation menu that slides over the article list, rather than underneath it. There was a time not so long ago when reading web-based content required patience while sifting through pop-ups, inline ads, and poorly-formatted HTML. While things have improved in recent years—especially with iOS 9’s adoption of content blockers—nothing beats cozying up with a good “read later” app that makes everything look neat, clean, and most importantly, ad-free. When I think of “read later,” Instapaper is the first app that springs to mind. That’s not just because it was one of the first such services to save web content from browsers back in early 2008, but Instapaper also continues to offer the best experience without the unnecessary bells and whistles of its rivals. 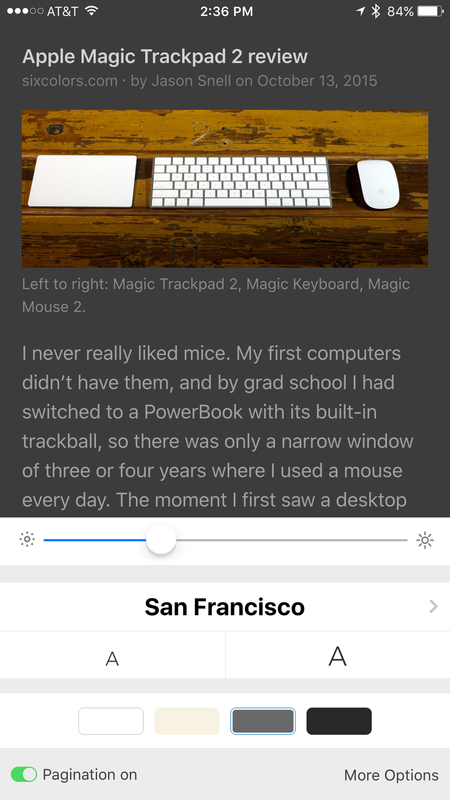 If you love Apple’s new San Francisco font in iOS 9, you can now use it everywhere in Instapaper 7. Another visual flourish is the addition of image thumbnails in article rows, which provides welcome context from the typical rows of text found in previous versions. If you prefer to see a snippet of each article, image thumbnails can be toggled off in Settings for a more traditional appearance. A subtler enhancement is how the navigation menu now slides over the article rows instead of appearing from underneath them. While Instapaper’s navigation menu was never slow, this method feels faster in daily use, and can be called up from Home view by tapping the icon in the upper left corner or swiping from the left edge of the display. On the iPad, Instapaper can now display image thumbnails in grid view — but only at the expense of a text preview. Although the new iPad Pro isn’t available at the time this review was written, Instapaper 7.1 already includes support for Cupertino’s big-screen tablet. The previous 7.0 update introduced multitasking support, allowing Instapaper to run alongside other compatible apps when using an iPad Air 2 or higher. 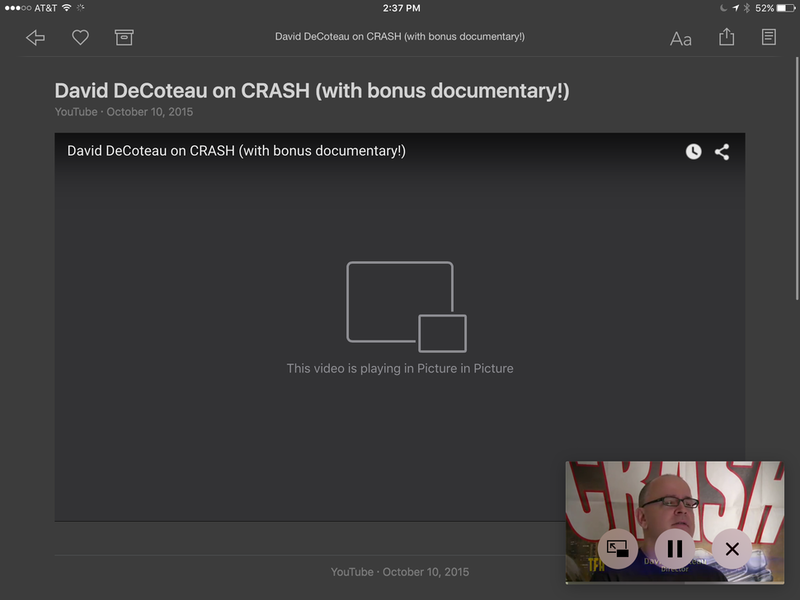 YouTube and Vimeo videos saved to Instapaper 7 can also be displayed picture-in-picture, but you won’t be able to browse other articles while doing so. To better facilitate multitasking, Instapaper slightly tweaks the appearance of grid and row cells on iPad. One downside of this change is you’ll have to choose between a grid of either text previews or image thumbnails—you can only view both while in list view. 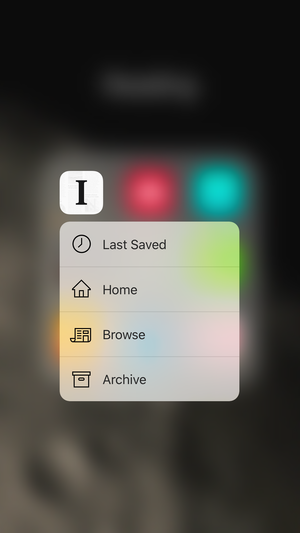 Instapaper 7.1 also introduces support for iOS 9 3D Touch, with configurable Quick Action shortcuts from the home screen. While Instapaper may primarily be known as a read later app, it can also be used for saving video content for viewing at a more convenient time. iPad owners can now take full advantage of this functionality with picture-in-picture support for YouTube and Vimeo videos, although this only works best when jumping over to other apps—as soon as you attempt to browse another Instapaper article, the PiP window closes as well. Last but not least, Instapaper 7.1 also delivers support for 3D Touch, which can be used to preview links inside articles, or up to four Quick Action shortcuts from the home screen. Any of the navigation menu buttons can be configured from the app settings, which also includes very handy new Last Saved and Random options. 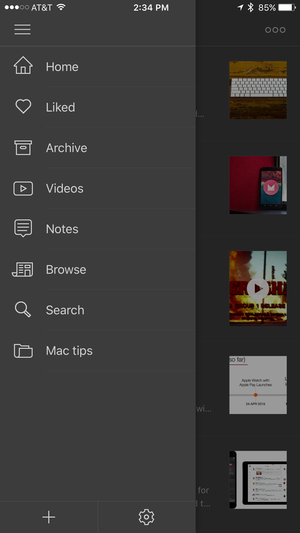 On the surface, Instapaper 7.1 may seem to offer only a few subtle improvements, but these changes collectively add up to an impressive update that takes full advantage of everything iOS 9 has to offer.